A three-channel monster that brings a warm musicality to TV and movies, the all-in-one HEOS Bar from Denon does so much more than merely boost the audio from a flatscreen TV. It's mostly about music, and more specifically, wireless streamed music from the likes of Spotify, Deezer and Soundcloud. As such, it directly challenges the likes of the Sonos Playbar, and for my money, it wins that contest hands-down. 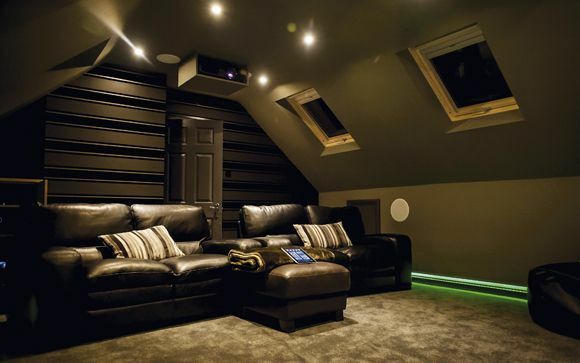 However, more impressive are its two home cinema features; HDMI switching, and an ability to add wireless rear speakers to create an occasional 5.1 system. And what would you do with those two 'spare' rears when you're not watching films? Whole-home multiroom music, of course. At just over a metre long, the HEOS Bar is a good match for 50in and larger screen sizes (although there's nothing to stop you using this with a smaller display, as long as your AV furniture can accommodate it). There are two ways to use it; on a wall or placed in front/below a TV. Two brackets in the box act as either wall fixings or as props to lift the product off a TV stand. The HEOS Bar does need to be turned through 180 degrees between its two orientations, which means the logo would be upside down for one of them. Luckily, Denon has thought of that, and the logo pops up and swivels around. Each of the soundbar's three channels (left, centre, right) are given a pair of 2in x 5in oval woofers and a 1.5in tweeter, with six Class D amplifiers providing power. While it behaves well on its own and makes for a clutter-free solution, it's possible to add a HEOS Sub (£600) to arrive at a 3.1 system. You can go to 5.1 with a pair of HEOS 1 HS2 wireless speakers (£150 each), and make the best use of onboard Dolby TrueHD and DTS-HD MA decoding. As with all Denon's HEOS hardware, operation is mostly done via the free HEOS smartphone/tablet app. In use, this offers a similar approach to the app used by Sonos, with the same process of logging-in in-app to specific music streaming platforms, and cueing up songs to play next. Where the HEOS Bar differs from some of its rivals (the Sonos Playbar in particular) is its more balanced musical sound quality. And despite the HEOS app lacking much in the way of audio tweaks, I never felt any real need for them; Björk's Utopia, streamed from the Deezer HiFi platform (16-bit/44.1kHz FLAC), is conveyed by this soundbar with a good mix of detail and warmth. Even more detail is dragged from some hi-res FLAC and WAV music files fed from a USB thumb-drive (although, sadly, that USB slot, being mounted on the back, is particularly hard to reach when the HEOS Bar is in front of a TV). It's almost as adept with movies, offering enough bass response during a run-through of Star Wars: The Last Jedi (Ultra HD Blu-ray) to bring scale to the onscreen action, plus a good sense of channel separation. Denon's virtual surround mode doesn't noticeably change much at all, however. Another area where the HEOS Bar rises to the cream of the crop is with its HDMI 2.0a switching. Able to passthrough 4K HDR video, it's possible to attach four source devices in a home entertainment setup. In my tests I did experience a few switching delays, but lip-sync was kept in check. Soundbars that do anything other than disappoint are rare, but the entry here of a heavyweight audio brand is a chance to witness powerful, detailed and warm sonics in spades. Add in the wireless streaming, multiroom, 4K HDR-ready HDMI switching functionality and system expandability, and it's hard to think of the HEOS Bar as anything other than a thoroughly modern soundbar that takes full advantage of Denon's musical heritage. We say: Able to stream music, act as a system hub and initiate wireless multiroom, it's still the warm musicality that impresses most.